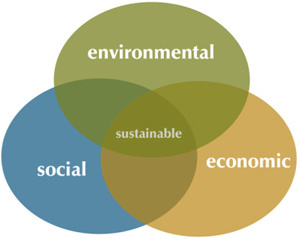 developing in a manner that meets the needs of the present without compromising the ability of future generations to meet their own needs, while striking a balance between economic prosperity, social responsibility and environmental stewardship. A sustainable community balances its social, economic and environmental components while improving the quality of life for both existing and future generations. Ultimately, the goal of sustainability is to enhance people’s well-being while living within the capacity of the eco-system.